Hotel Villa Kastelruth in the heart of Castelrotto (Alpe di Siusi) offers modern comfort in a historic Villa ambience. 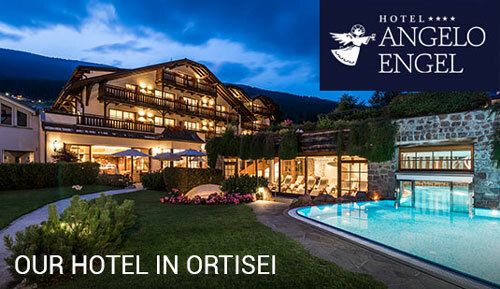 Hotel Villa Kastelruth, built over a century ago as an alpine nursing home and recently renovated, welcomes you with only 28 rooms in the centre of the famous village of Castelrotto in the Italian Alps. 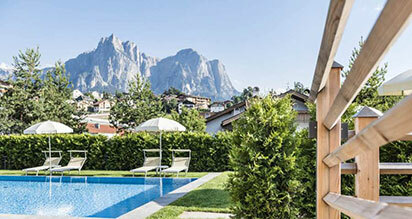 With its sunny garden, the year-round heated outdoor pool and the spectacular panoramic sauna, it offers breathtaking views of the surrounding Dolomites, UNESCO World Heritage Site. Come and discover the legendary Dolomites in summer with our guided hikes and in winter with guided skiing and exciting snowshoe hikes in the snow. After an active day, you can relax with a dip in the heated swimming pool, the pleasant warmth of the spacious Tyrolean sauna, the panoramic jacuzzi and the adjacent wellness-relaxation area. Since 1903 hospitality, excellent cuisine and the best service are cultivated at Hotel Villa Kastelruth. 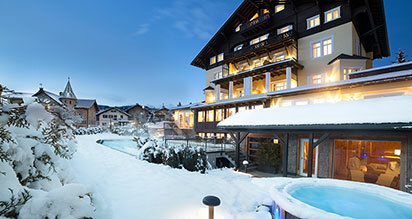 Recently refurbished in accordance with alpine tradition and great attention to detail, the hotel is managed smartly to offer its guests genuine South Tyrolean hospitality. Not two rooms in our historical Hotel Villa Kastelruth are alike, because no two guests are alike. Our guests can choose between comfortable Standard rooms, slightly larger Comfort rooms, generous Superior rooms with cozy seating corner, spacious Deluxe rooms with large balcony and Junior Suites with a separate living area. Most of the rooms have balconies and wonderful views of the surrounding mountains. A generous 15-meter outdoor pool overlooking the mountains of the Dolomites invites our guests to swim, cool off and relax. At the Villa Kastelruth you will find an extensive breakfast buffet (until 10:30 am), a courtesy afternoon snack at the bar and a 4-course à la carte dinner including local Alpine and other Italian dishes. When composing our menus, we prefer seasonal, local products, which are processed to seductive creations every day with a lot of refinement. The selection also includes vegetarian specialities, fine fish dishes and special gluten-free dishes for coeliacs. 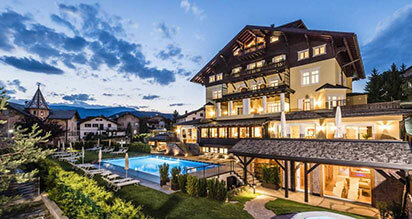 Hotel Villa Kastelruth is located centrally in Castelrotto, the largest town in the Seiser Alm region. It is an ideal starting point for walks in the Dolomites, hikes on the Seiser Alm/Alpe di Siusi, to Tires, Val Gardena and the Schlern mountain. The public shuttle to the cable car to the Alpe di Siusi stops directly in front of the hotel. The summer of Castelrotto is the summer for those who love nature and the mountains. Hundreds of kilometers of hiking trails lead to the most beautiful spots of the Dolomites and the Alpe di Siusi. Before taking his leave, the summer of Castelrotto dresses up in his most beautiful dress, offering the eye of his visitor a beautiful spectacle of autumn colors. Castelrotto is the birthplace of many world-class skiers, grown up on the slopes of the Alpe di Siusi and other parts of the Dolomiti Superski, the largest connected skiing area in the world. Skiing, hiking - Unforgettable South Tyrol holidays in the midst of the majestic Dolomites, UNESCO World Heritage Site.